Hidden Springs was started by two couples -- Al & Jo Alexanderson and Don & Carolyn Byard. Al and Don were the winemakers in addition to their full time jobs of attorney and highway planner. Their 150 acre property was located in the Eola Hills west of Salem. In 1972 they planted a 23 acre vineyard, mainly Pinot Noir, Riesling, and Chardonnay. First commercial wine was produced in 1980. 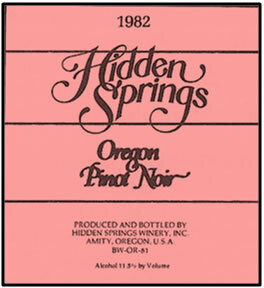 The 1980 Pinot Noir was a big success winning gold and silver medals. Their Pacific Sunset, a blend of Riesling, Pinot Noir, and Sauvignon Blanc was also popular. An old prune dryer upgraded with a lot of elbow grease served as the winery and tasting room. The vineyard and winery were named after an actual “Hidden Spring” on the property. The winery was located at: 9360 S.E. Eola Hills Road, Amity, OR.